Located on the 38th and 39th floor, with a 360-degree view of the city, Sushi Samba offers a unique blend of Japanese, Brazilian and Peruvian cuisine, culture and design. 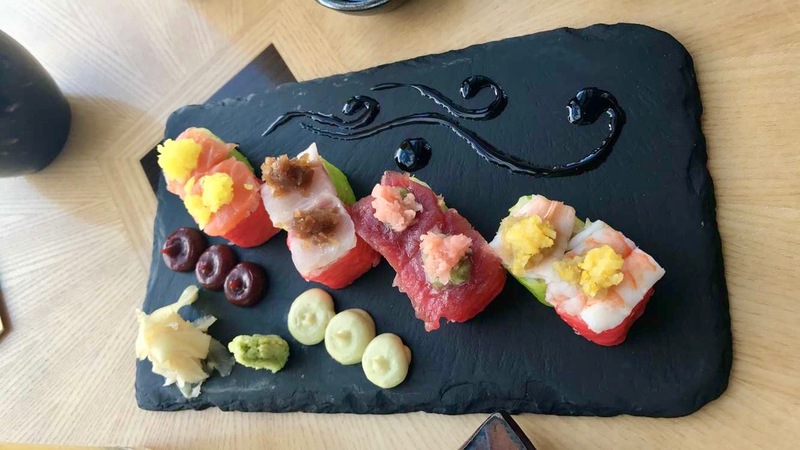 I have to admit that before going to Sushi Samba I was not a huge fan of sushi (I know you are probably asking why I went but if you must know I was dragged along by my very persistent friend). However, having visited the restaurant, which makes you feel as if you are dining in the sky, I can honestly confess that I have been well and truly converted to the sushi way of life. I would not go as far as saying I will eat it every day, but I would definitely recommend it to other people who might be reluctant to try it like I was. Upon entering the skyscraper building you are gestured towards a glass lift which then flies up I don’t even want to think how many flights of stairs in seconds. As you are transported higher and higher, you are also given a breath-taking view of the city and are able to pick out various landmarks in the city’s skyline. The location of Sushi Samba is one of its greatest selling points. 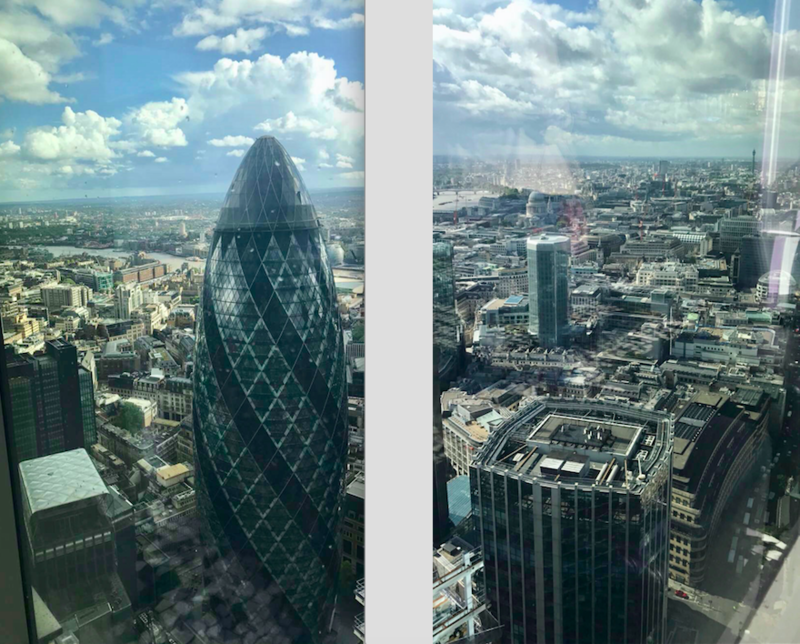 It is situated a five-minute walk from Liverpool Street station and is close to other famous buildings such as the Gherkin, in fact it is so close that you can practically see through into the Gherkin itself! What is more, Sushi Samba also makes for the perfect Instagram worthy photos with the London skyline as your backdrop. When you walk through the glass doors of the restaurant, the first thing that you notice and which fills you from head to toe with amazement, is the magnificent bamboo-lattice ceiling and the little droplets of light hanging down. You really do feel as if you have travelled to some exotic destination abroad as opposed to being in the heart of the city. For a booking of 2 people, you generally get given the table seated next to the window which gives you an incredible outward-facing view of the city and is, in my opinion, the best seating area in the entire restaurant. Once seated, you are allocated a waiter who goes through the menu with you, and is there for your every need. Sushi Samba is highly praised and renowned for its unique colourful dishes (as the pictures in this article show), and everything is visually appealing and equally incredibly appetising. You really do get the sense that Sushi Samba is first-class fine dining and I find it very hard to believe that anyone would leave the restaurant disappointed. ATTENTION: One thing to note is that they do have a strict dress code and they are usually booked up for weeks in advance. 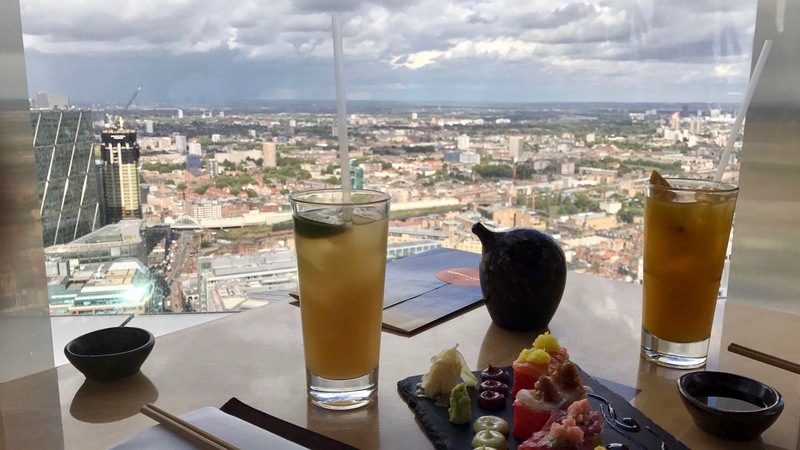 It is also a little on the pricey side, however with the food you get at Sushi Samba, as well as the views, the restaurant really is worth blowing your normal budget for. It also helps if you go when your student finance is due to drop soon! Or why not even go just for a cocktail or two of an evening as an alternative option? 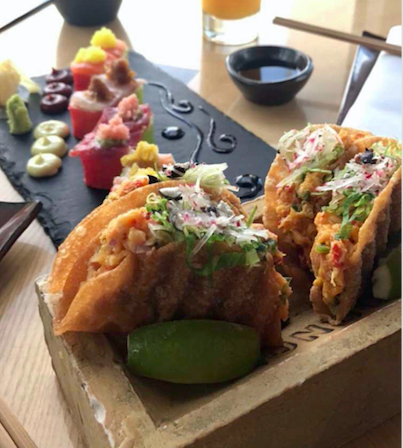 Whether it be for a night out, or a special occasion, Sushi Samba ticks all the right boxes, even for someone like me, who was not initially a fan of sushi. It is also worth taking a walk around the outside balcony, which features a bar and a beautiful orange cocktail tree which is illuminated at night. This is the very spot where most people take their pictures for their Instagram posts, but I would say that every inch of Sushi Samba provides the perfect photo opportunity. But do not just take my word for it, go check it out for yourself!